Plus: How President Trump's first State of the Union is playing in the media on Wednesday morning. This much is undebatable: President Donald Trump can provoke an online conversation. 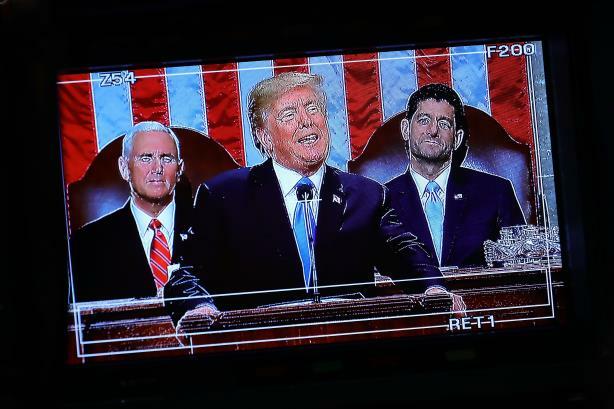 Tuesday night’s State of the Union address was the most-tweeted-about speech to a joint session of Congress since such distinguished records have been kept (Twitter). Trump touted his economic record (New York Times) and extended an olive branch of sorts to Democrats (CNBC) while taking a hard line on immigration (Politico) and North Korea (US News & World Report). There was some drama: first lady Melania Trump arrived separately from her husband (CNN). And some actual news was made, as the president signed an executive order to keep Guantanamo Bay open just before the speech (NPR). Rep. Joe Kennedy (D-MA) delivered the Democratic response (Slate). There was a major news dump, too. Hillary Clinton posted a lengthy explanation on Facebook for why her 2008 campaign did not drop adviser Burns Strider after he was accused of sexual harassment by staffers. The account was published moments before the State of the Union began (Business Insider). Here’s how the State of the Union is playing in the media this morning: ‘Gloomy.’ ‘Amazing.’ Trump’s speech divided the pundits (NYT); President tries taking on a new role: optimist (Wall Street Journal); In tone and content, Trump behaved like the politician he says he’s not (Washington Post); Call for bipartisan unity met with glum resistance from top Dems (Fox News); Trump talks unity, sows division in State of the Union (NBC News). What to watch today: Facebook is set to report its fourth-quarter earnings after the market closes. Keep an eye on information about changes to News Feed and the impact of the tax law (WSJ). And: Facebook is banning cryptocurrency ads (Quartz). Instagram users don’t think United Airlines’ latest controversy is strictly for the birds. Dexter, the "emotional support peacock" and Bushwick resident that wasn’t allowed on a flight this week has found fame on Instagram (Vice). He’ll also get to see the country in a cross-country ride with his artist owner in lieu of a flight (Newsweek).